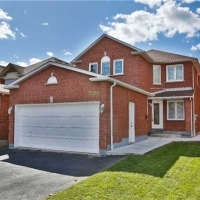 Absolute Gorgeous Fully Upgraded Detached Home On A Cul De Sac In Heartland!4Br&4Bath W/Finished Bsmt Apartment!Formal Liv&Din Rm!New Hardwood Flrs Throughout!Welcoming Fireplace In Family Rm!Stunning Kitchen W/Quartz Counter,S/S Backsplash,Pot Lights,New Cabinetry W/Soft Closure!Brft W/O To Green Yard!Freshly Painted!Mstr W/Walk In Closet&Ensuite!Upgrd Bath W/Quartz Counter Vanity! All Spacious Bdrms! Finished Basement W/2Bdrm, Rented $1100 Monthly! Includes: Brand New S/S Appliances-Fridge,Stove,Dishwasher,Washer,Dryer,All Elf's,Chandeliars,All Window Coverings,Cac.Minute To Public Transit,All Hwy's,Rivergrove Community Centre.Schools-Hazel Mccallion,Whitehorn Pub,Rick Hansen Ss!